Cellist Yo-Yo Ma is 63 on Oct. 7. Oct. 7: TV personality Joy Behar (”The View”) is 76. Drummer Kevin Godley of 10cc is 73. Country singer Kieran Kane of The O’Kanes is 69. Musician John Mellencamp is 67. Guitarist Ricky Phillips of Styx is 67. Actress Mary Badham (”To Kill a Mockingbird”) is 66. Drummer Tico Torres of Bon Jovi is 65. 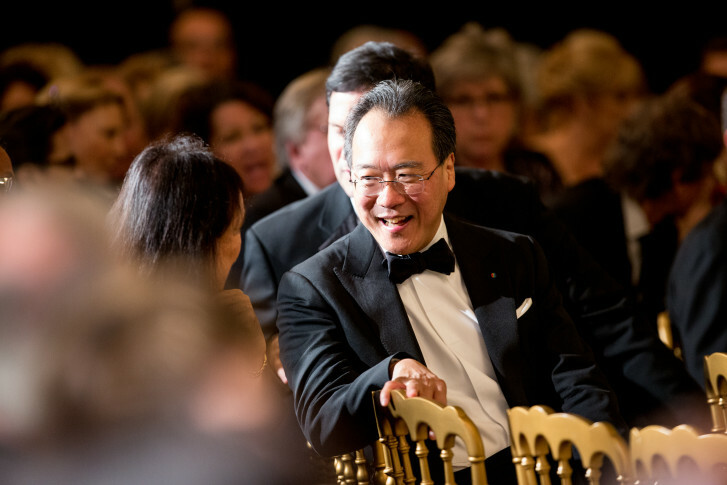 Cellist Yo-Yo Ma is 63. Gospel singer Michael W. Smith is 61. Reality competition judge Simon Cowell is 59. Guitarist Charlie Marinkovich of Iron Butterfly is 59. Singer Ann Curless of Expose is 55. Singer Toni Braxton is 51. Singer Thom Yorke of Radiohead is 50. Actress Allison Munn (”One Tree Hill”) is 44. Singer Damian Kulash of OK Go is 43. Singer Taylor Hicks (”American Idol”) is 42. Singer Nathaniel Rateliff of Nathaniel Rateliff and the Night Sweats is 40. Actor Jake McLaughlin (”Quantico”) is 36. Electronic musician Flying Lotus is 35. Actress Holland Roden (TV’s “Teen Wolf”) is 32. Oct. 8: Actor Paul Hogan is 79. Singer Fred Cash of The Impressions is 78. Actor-comedian Chevy Chase is 75. Author R.L. Stine (”Goosebumps”) is 75. Country singer Susan Raye is 74. TV personality Sarah Purcell (”Real People”) is 70. Singer Airrion Love of The Stylistics is 69. Actress Sigourney Weaver is 69. Singer Robert “Kool” Bell of Kool and the Gang is 68. Singer-guitarist Ricky Lee Phelps (Brothers Phelps, Kentucky Headhunters) is 65. Comedian Darrell Hammond is 63. Actress Kim Wayans (”In the House,” `’In Living Color”) is 57. Singer Steve Perry of Cherry Poppin’ Daddies is 55. Actor Ian Hart (”Dirt”) is 54. Singer CeCe Winans is 54. Bassist C.J. Ramone of The Ramones is 53. Actress Karyn Parsons (”The Fresh Prince of Bel-Air”) is 52. Singer Teddy Riley is 52. Actor Dylan Neal (”Blood Ties,” `’Sabrina, The Teenage Witch”) is 49. Actor-screenwriter Matt Damon is 48. Singer Byron Reeder of Mista is 39. Singer Noelle Scaggs of Fitz and the Tantrums is 39. Actor Nick Cannon is 38. Singer-songwriter Bruno Mars is 33. Actor Angus T. Jones (”Two and a Half Men”) is 25. Actress Molly Quinn (”Castle”) is 25. Actress Bella Thorne (TV’s “Shake It Up,” film “Midnight Sun”) is 21. Oct. 9: R&B singer Nona Hendryx (LaBelle) is 74. Singer Jackson Browne is 70. Actor Gary Frank (”Family”) is 68. Actor Robert Wuhl (”Arli”) is 67. Manager-TV personality Sharon Osbourne is 66. Actor Tony Shalhoub is 65. Accordion player James Fearnley of The Pogues is 64. Actor Scott Bakula is 64. Actor John O’Hurley (“Seinfeld”) is 64. Actor Michael Pare (”Eddie and the Cruisers”) is 60. Singer-guitarist Kurt Neumann of The BoDeans is 57. Country singer Gary Bennett (BR549) is 54. Director Guillermo del Toro is 54. Singer P.J. Harvey is 49. Actor Steve Burns (”Blues Clues”) is 45. Singer Sean Lennon is 43. Musician Lecrae is 39. Actor Brandon Routh (”DC’s Legends of Tomorrow,” `’Superman Returns”) is 39. Actor Zachery Ty Bryan (”Home Improvement”) is 37. Comedian Melissa Villasenor (”Saturday Night Live”) is 31. Actor Tyler James Williams (”Everybody Hates Chris”) is 26. Country singer Scotty McCreery (”American Idol”) is 25. Oct. 10: Actor Peter Coyote is 77. Actor Charles Dance (”Game of Thrones”) is 72. Singer John Prine is 72. Actor-dancer Ben Vereen is 72. Singer Cyril Neville of The Neville Brothers is 70. Actress Jessica Harper (”Pennies From Heaven,” `’My Favorite Year) is 69. Singer-guitarist Midge Ure is 65. Singer David Lee Roth (Van Halen) is 64. Country singer Tanya Tucker is 60. Actress Julia Sweeney (”Saturday Night Live”) is 59. Actor Bradley Whitford (”The West Wing”) is 59. Bassist Martin Kemp (Spandau Ballet) is 57. Guitarist Jim Glennie of James is 55. Drummer Mike Malinin of the Goo Goo Dolls is 51. Actress Wendi McLendon-Covey (”The Goldbergs,” `’Reno 911!”) is 49. Actor Mario Lopez (”The X Factor,” `’Saved by the Bell”) is 45. Singer Mya is 39. Actor Dan Stevens (”Downton Abbey”) is 36. R&B singer Cherie is 34. Oct. 11: Actor Ron Leibman is 81. Country singer Gene Watson is 75. Singer Daryl Hall of Hall and Oates is 72. Country singer Paulette Carlson (Highway 101) is 67. Actor Stephen Spinella (”24”) is 62. Actress Joan Cusak is 56. Guitarist Scott Johnson of Gin Blossoms is 56. Actor-writer Michael J. Nelson (”Mystery Science Theater 3000”) is 54. Actor Sean Patrick Flanery is 53. Actor Luke Perry is 52. Actor Artie Lange (”MADtv”) is 51. Actor Jane Krakowski is 50. Rapper U-God of Wu-Tang Clan is 48. Actress Constance Zimmer (”UnREAL,” `’Agents of S.H.I.E.L.D.”) is 48. Rapper MC Lyte is 47. Actor Darien Sills-Evans (”Superior Donuts,” `’Treme”) is 44. Singer NeeNa Lee is 43. Actress Emily Deschanel (”Bones”) is 42. Actor Trevor Donovan (”90210”) is 40. Actress Michelle Trachtenberg (”Buffy the Vampire Slayer,” `’Inspector Gadget”) is 33. Rapper Cardi B is 26. Oct. 12: Singer Sam Moore of Sam and Dave is 83. “Fox News Sunday” host Chris Wallace is 71. Actress-singer Susan Anton is 68. Jazz musician Chris Botti is 56. Singer Claude McKnight of Take 6 is 56. Actor Hugh Jackman is 50. Actor Adam Rich (”Eight Is Enough”) is 50. Singer Garfield Bright of Shai is 49. Fiddler Martie Maguire of the Dixie Chicks and of Courtyard Hounds is 49. Actor Kirk Cameron is 48. Singer Jordan Pundik of New Found Glory is 39. Actor Tyler Blackburn (”Pretty Little Liars”) is 32. Actor Marcus T. Paulk (”Moesha”) is 32. Actor Josh Hutcherson (”The Hunger Games”) is 26. Oct. 13: Gospel singer Shirley Caesar is 81. Actress Melinda Dillon (”A Christmas Story”) is 79. Musician Paul Simon is 77. Keyboardist Robert Lamm of Chicago is 74. Country singer Lacy J. Dalton is 72. Actor Demond Wilson (”Sanford and Son”) is 72. Singer Sammy Hagar is 71. Singer John Ford Coley of England Dan and John Ford Coley is 70. Actor John Lone (”Rush Hour 2”) is 66. Model Beverly Johnson is 66. “The X-Files” creator Chris Carter is 62. Singer-actress Marie Osmond is 59. Singer Joey Belladonna of Anthrax is 58. Actress T’Keyah Crystal Keymah (”That’s So Raven”) is 56. Actress Kelly Preston is 56. Country singer John Wiggins is 56. Actor Christopher Judge (TV’s “Stargate SG-1”) is 54. Actor Matt Walsh (”Veep”) is 54. Actor Reginald Ballard (”Martin,” `’The Bernie Mac Show”) is 53. Actress Kate Walsh is 51. Musician Jeff Allen of Mint Condition is 50. Actress Tisha Campbell-Martin (”My Wife and Kids,” `’Martin”) is 50. Singer Carlos Martin of Il Divo is 50. Country singer Rhett Akins is 49. Actor Sacha Baron Cohen is 47. Singers Brandon and Brian Casey of Jagged Edge are 43. Singer Ashanti is 38. Actor Caleb McLaughlin (”Stranger Things”) is 17.